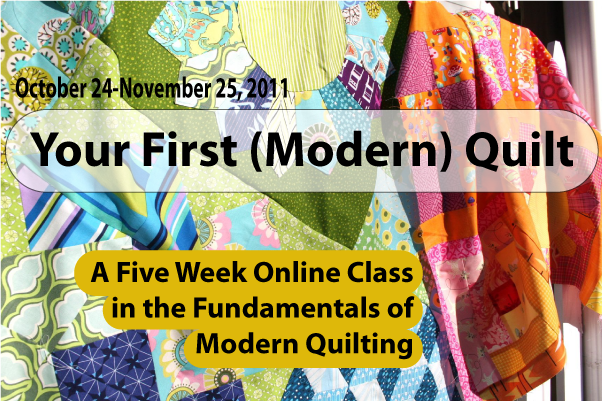 There are still spots left in the Modern Quilt online class starting next Monday! Read the full description here. The e-course is primarily video instruction, along with photos, downloads, and some amazing audio interviews with folks like Elizabeth Hartman of Oh, Fransson! ; Rachel of Stitched in Color; Sarah Fielke of Material Obsession fame; Amanda McPorkchop of Ms. McPorkchop Quilts and The Frosted Pumpkin; and Ashley from Film in the Fridge. I know! So many folks who are doing huge things in modern quilting right now, and you’ll ONLY hear these interviews as part of the online modern quilting class. Check out the full list of traditional blocks we’ll be making as we work our way through learning core quilting skills, then register and hold on to your hat! Woot! ← Sewing with Oilcloth Author Book Signing TONIGHT! Does this class “meet” every day? For how long? What happens if I get behind? There is a new lesson every day for five weeks, but the content is archived, so you’re free to log on and participate whenever your schedule allows! The whole course stays live and accessible to you until mid-January 2012, so you’ve got lots of time to work at your own pace and continue to ask questions if you get stuck. I registered for the course, paying through PayPal — will I be receiving some communication about the course soon?